Don Johnston’s new Snap&Read delivers text-to-speech in a simple package that installs as a two-button toolbar floating over any open desktop or laptop application. It can read aloud just about any user-selected words, phrases or paragraphs, including text embedded in a Flash website (e.g. K12 Inc.’s online curriculum), Microsoft Word document, PDF image or text, NWEA’s MAP test, or software dialog box. Snap&Read is simple, elegant and compact. The application runs on both Macintosh and Windows computers, operating identically on both platforms. At program start-up, its colorful toolbar rests unobtrusively in the upper right hand corner of the screen, but users can easily drag it to a different location as needed. When reading text aloud, Snap&Read uses one of two high-quality Acapella voices (one male, the other female) it installs at setup. Application Preferences allow users to choose which voice they prefer. Preference options also allow users to adjust the speech rate and determine if Snap&Read reads aloud toolbar and dialog text (see below). Once launched, the Snap&Read toolbar never gets buried. It floats over the active window, always visible, always within clickable reach. To have it read text aloud, click the toolbar’s photo lens button icon, then drag across the desired text so that it appears within the orange guide lines. This activates the program’s OCR engine and directs Snap&Read to read the selected text aloud. To prevent the program from automatically reading aloud selected text, go to program Preferences and de-select “auto speak on select.” If you choose this option, you must click the sound icon to read aloud selected text (see below). Click the X button to return to your work. The program is easy to use, but for help with getting started or configuring optional Preferences, you can view, or download and print the Getting Started guide from the Program’s Help files. A Snap&Read Keyboard Equivalents PDF, also available from the Help menu, provides shortcut keys you can use to call program features into play. 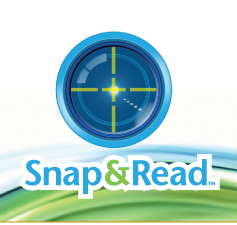 Snap&Read supports student-directed, independent learning by giving users audible access to text that displays on screen. This audio text-to-speech mode helps make text available to English language learners, developing readers and individuals with vision problems. Writers who need editing help can also use it as a proofreading tool. They can listen for confusing phrases or awkward wording when hearing their text read aloud. The toolbar’s minimalist two-button interface doesn’t overwhelm users with distracting options. You can have Snap&Read automatically read selected text, or turn off the automatic feature for greater control. Once the program has OCR’ed selected text in preparation for the read-aloud, it identifies words it cannot recognize or those that will be read aloud incorrectly, giving users the option of correcting OCR errors (see below). Schools looking for a simple and affordable way to read screen text aloud will appreciate the user-friendly, customizable and economically-priced Snap&Read. The program works with all manner of text, including words found in K12 Inc.’s virtual school curriculum, or text that displays on Accelerated Reader, NWEA MAP tests, Study Island, and Discovery Education Web pages. Users can install Snap&Read on a stand-alone computer or load it onto on a USB Flash drive and run it directly from the USB device. When available on a flash drive, teachers can move the software from one computer to another as needed. The program is trainable. For example, when it read the word “children” incorrectly in a selected paragraph, I could use the editor to “teach” it how to read the word correctly, then return to the selected text and listen a second time. Regrettably, Snap&Read doesn’t “remember” the fix once you quit the program. If you close the application and return to the same paragraph, the mispronunciation reoccurs. Compared to the text-to-speech technology built into the Macintosh operating system, or NaturalSoft’s free NaturalReader 10 for Windows (http://www.naturalreaders.com), Snap&Read scores high points for reading inaccessible text, such as words on Flash Web pages or words embedded in images. It’s two Acapella 22k speech synthesis voices (Heather and Ryan) are of higher quality than the voices that come with the commercial Read&Write Gold for Macintosh or Windows. On the other hand, Snap&Read is also somewhat limited compared to other solutions. For example, unlike NaturalSoft’s free NaturalReader 10 for Windows (http://www.naturalreaders.com), it can’t convert selected text into an MP3 or WAV audio file for listening at a later time. And, unlike the free built-in Macintosh text-to-speech, free NaturalReader, or the commercial Read&Write Gold for Macintosh or Windows, Snap&Read’s OCR rendering engine doesn’t score high points for reading accuracy. When I tested its read-aloud capabilities on a paragraph that I also read-aloud using the above-mentioned free and commercial tools, Snap&Read mispronounced words or read them incorrectly more often than the others. Snap&Read also doesn’t do well with serif typefaces, words that use varying font sizes, and ampersands. I suspect that Snap&Read’s OCR accuracy will improve as Don Johnston continues to develop the product. The current version does represent a very economically priced solution for occasions when the free tools don’t work. Two-button floating toolbar will read aloud text embedded in a Flash website, Microsoft Word document, PDF file, picture, or dialog box. Comes with two high-quality Acapella speech synthesis voices. Preference settings allow users to personalize the program for individual use.